Don’t miss Part 2 of this series: Spotlight on Ferguson: A First-hand Account. To donate to support continued documentation by #SpotlightOnFerguson, please visit: igg.me/at/dontshoot. Mike Brown’s Memorial – Canfield from Katina Parker on Vimeo. I’ve spent the last few months traveling back and forth to Ferguson, documenting and organizing against police brutality. It’s been intense. Inspiring. Invigorating. To see so many people from so many different walks of life in the streets challenging state sanctioned violence, bangin’ on the system, so to speak. VonDerrit Myers, Jr. – #BlackLifeMatters from Katina Parker on Vimeo. Initially, I came Labor Day Weekend with the #BlackLivesMatter ride in response to a call from local organizers for photographers and videographers to help tell the stories of resilience, sacrifice and commitment embodied by protesters, stories the media does not share or promote. #FergusonOctober – St. Louis Police Tear Gas Protestors – October 11, 2014 from Katina Parker on Vimeo. I emerged with clear-cut next steps. On October 8th, I launched CLASS IS IN SESSION – VIRTUAL FREEDOM SCHOOL –www.facebook.com/virtfreeschool. This bi-monthly call-in/webinar is hosted by activists and educators who are committed to discussing, deconstructing, and transforming our collective ideas about policing, as they originated from the crippling institution of slavery, Indian removal, and border wars. This is a soulful/hope-filled exploration of the ideas, projections and power dynamics that we continue to actively resist. The racism. The sexism. The classism. All the ways we have become disfigured and conflicted by the perpetuated and manipulated imprint of White supremacy. COMMUNICATIONS TRAINING AND MENTORSHIP for Ferguson youth activists who want to control their narrative. I was approached by a number of young people who’ve been thrust into the national spotlight as a result of leading protests. They need both short- and long-term advisement as they continue to perpetrate acts of civil disobedience that keep Mike Brown’s murder in the news and help shift the mainstream narrative that more often than not, justifies racist police abuses while vilifying and diminishing Black and Brown youth. A campaign that directly examines, questions, and awakens the humanity of police officers nationwide. I’m still visioning the latter. If you are an artist or an activist interested in the latter, contact me directly. I launched Spotlight on Ferguson (www.facebook.com/dontshootsof), my own continued commitment to documenting and distributing images about the aftermath of Mike Brown’s murder. This commitment requires that I travel back and forth between my home in North Carolina and Missouri. Ferguson has become an epicenter and a training ground for the resistance movement against capitalism and tyranny that so many of us have been building for all these years. Now 130+ days in, Ferguson and beyond have become the longest sustained acts of civil disobedience in America since the Montgomery Bus Boycott, which lasted 381 days. What has emerged is a multi-ethnic, intergenerational, LGBTQ-inclusive, youth-led movement that is supported and advised by elders who are primarily clergy, parents, and veteran activists. We are nowhere finished. In fact, we are just getting started. I Believe That We Will Win – Rally Cry for VonDerrit Myers, Jr. from Katina Parker on Vimeo. To follow my posts about Ferguson and beyond find me on Facebook, Vimeo and Twitter @katinaparker. To donate to support continued documentation by #SpotlightOnFerguson, please visit: igg.me/at/dontshoot. 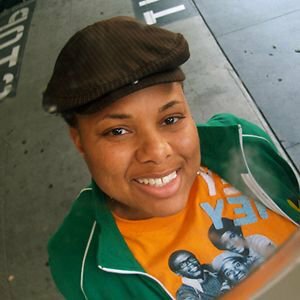 Katina Parker is a filmmaker, photographer, writer, graphic designer, cultural curator, social media expert, and communications consultant. Through her work she speaks to the multi-dynamic possibilities of technology and media to spark social and cultural change for voices who have traditionally been under-represented in media. Born in Oklahoma City and raised in Wilmington, Delaware, she received her M.F.A. in Film Production from the University of Southern California and her B.A. in Speech Communications from Wake Forest University. Previously, she has been mentored by Inaugural Poet Maya Angelou, Poetry Legend Sonia Sanchez, Emmy Award-winning documentarian Alan Berliner, and veteran sitcom Director Peter Bonerz. Parker teaches social media and film through the Center for Documentary Studies (CDS) at Duke University.